Megan and Harry’s Dad, Andrew, was diagnosed with bowel cancer and secondary liver and lung on 23 December 2016. We decided to give them a normal Christmas then tell them, and so we told them two days after Christmas. After the holidays, Megan went back to university in Edinburgh and Harry continued with school, but they were always helping out and Skyping home. Andrew was on very high dose of chemotherapy which really did make him very unwell. He also had to have a colostomy bag fitted too. He fought like a warrior, as Harry says, and never complained. 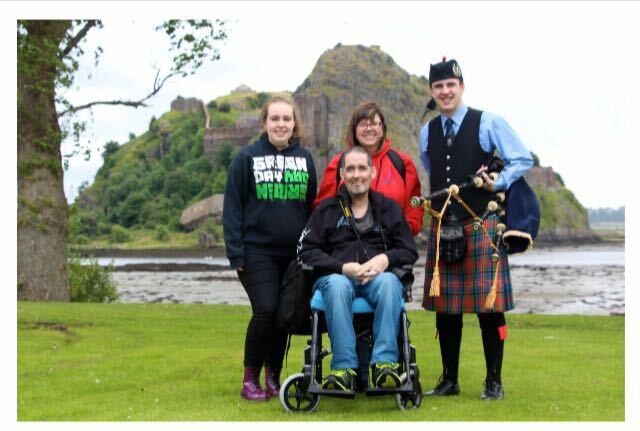 He did his best to muster up the strength to collect Megan from university, go and watch Harry play in the World Pipe Band Championships, and keep the family going for as long as he could, until he died on 28 August 2017. 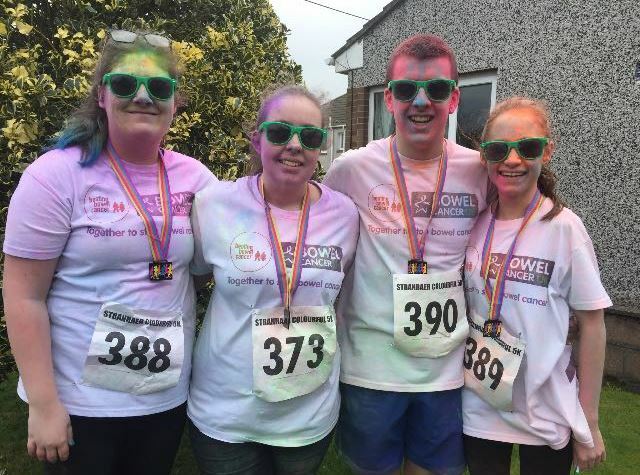 We live in Stranraer so when we saw they were going to do a 5k Colourful Run we thought it would be fun and we could not just do it, but raise money for Bowel Cancer UK too. We wanted to help support the charity as bowel cancer is now something so very close to our hearts. The day was cool but dry so we knew the powder was going to stick nicely to the t-shirts. Everyone had to walk round the park 4 times getting coloured powder thrown at them. Unfortunately there had been rain recently so some parts of the ground were pretty boggy. Erin and Harry took off running but that didn’t last! Paige managed to lose a shoe in the mud and Megan had to rescue it for her! Erin and Harry came in first but decided to keep going to join up with Megan and Paige so we could cross the finish line together and collect their medals. We all enjoyed the day and Dad was not far from our thoughts. We are sure he would be with us laughing and cheering us on, proud as ever.